This CSA farm directory lists Manitoba Community Supported Agriculture farms (also known as Community Shared Agriculture farms), their locations, contact information and websites. All CSA farmers in Manitoba can post their information on this directory, free of charge. Farms offering CSA programs are a convenient, affordable way to eat healthy, local foods. The concept is simple: You subscribe to the farm of your choice, by paying for a “share” at the beginning of the season. Then your CSA farm grows a wide variety of fruits and vegetables throughout the growing season, and delivers the produce each week to a pick up location near you. With a CSA program, farmers are guaranteed the sale of their crop and their members enjoy a steady supply of freshly harvested, local, sustainably grown food. 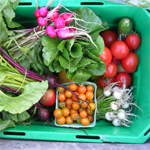 A typical CSA program runs 12 to 18 weeks, starting in mid to late June. While fruits and vegetables are most common, some CSA programs also offer eggs, honey, flowers, jams, poultry, and other meats. Membership in a CSA creates relationships between people and the food they eat, the land on which it is grown and those who grow it. This supportive relationship helps to create an economically stable farm operation. The members receive high quality produce, often at below retail prices. In return, farmers are guaranteed a reliable market for a diverse selection of crops. This allows farmers to ensure proper land stewardship practices in order for the soil to be healthy for generations to come. Why purchase from a CSA farm? You'll get the freshest produce available, picked the day you receive it, from a local farm. Local food is fresher, and tastes better than food picked before ripening that has been shipped thousands of miles. You'll know your farmer and how he/she produce your food. You'll support your local farmers, and keep your food dollars in your local economy, thus strengthening your local economy. Many CSA's offer recipes and hints on how to use the produce in your CSA box, encouraging you to try new and unusual vegetables and fruits. Personal contact with the farmer gives you the opportunity to ask questions about the practices the farmer uses. Local food purchases protect the environment: local food travels short distances, reducing the carbon dioxide emissions from transportation, and local food doesn't need all the plastic wraps and crates that food needs when it is being transported long distances. Sustainable growing practices benefit the soil, air, water, wildlife, and people in the farm ecosystem.